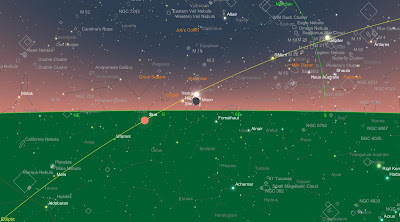 If your weather is clear for 4/2/19, and you have a good, unobstructed view of the Eastern horizon, make sure you get out about 30 minutes before local sunrise (check your local sunrise time) to see a nice sky sight. Depending on whether you are in the Northern or Southern Hemisphere impacts how well you will see the very old Waning Crescent Moon, Venus and Mercury. This sky sight favors the Southern Hemisphere as the three will be higher in the sky. For Northern Hemisphere observers if you have binoculars it will help to look for bright Venus first. The Moon will be directly below it with Mercury to the left. This star chart is for the Washington, D.C. region at 6:30 a.m.
Sky For Washington D.C. area 4/2/19at 6:30 a.m. I'll be trying for a pic from the Atlantic Ocean.